Pebble watch (UK buyer) - first impressions. 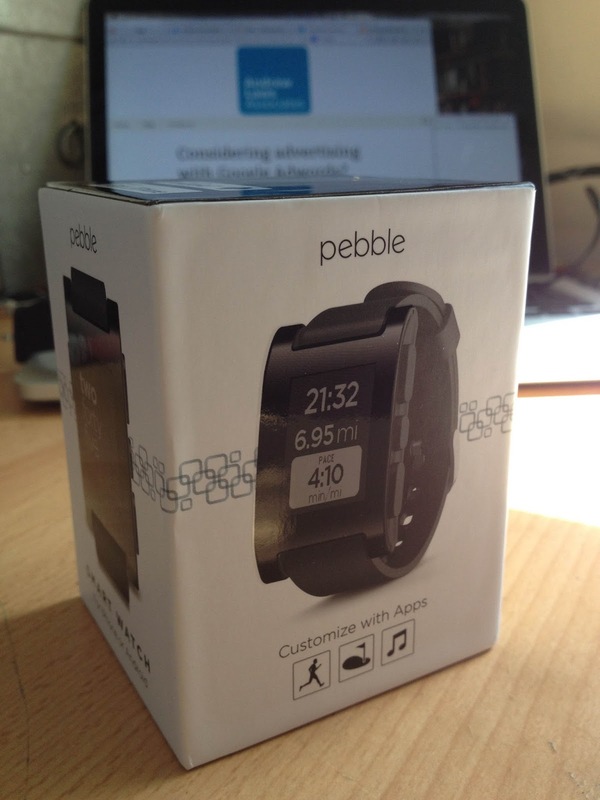 The Pebble watch caught my attention way the hell back when it was just a twinkle in a Kickstarter user's eye. The concept of a simple watch that connects with my smartphone is incredibly appealing, but the other options on the market were laughably large and woefully under-supported in terms of applications. I held off investing in Pebble because I wanted to see how much interest it gained, and oh boy did it gain interest, around $10m of interest! I checked in with the Pebble project website very few months but something was stopping me from putting my hand in my pocket - was this a toy or was it a useful tool? A couple of things convinced me to buy my own Pebble, the first being yet another bike ride where I missed a bunch of important calls and texts, and the second being the launch of a FourSquare app. I'm a bit obsessed with FourSquare but getting out my iPhone and staring at the screen every time my little family and I arrive somewhere new can put a bit of a dent in marital bliss.